In this chapter, the physical mechanisms of waves in causing sediment erosion and resuspension were investigated through field observations and laboratory flume experiments. To achieve this goal, several test devices were specially designed and developed. Sediments are found to experience an attenuation in erodibility under waves as pore pressure build-ups, i.e., the seabed liquefies. Besides, two modes of pore pressure response: transient pore pressure and residual pore pressure, were found to induce sediment resuspension through the way of “pumping” sediments out of the interior of the seabed. 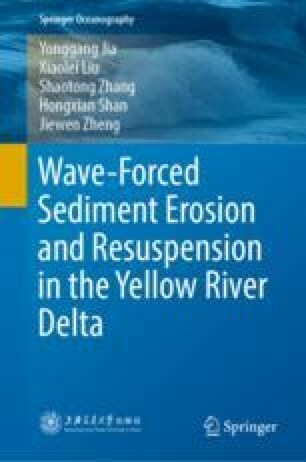 In the Yellow River Delta, waves not only erode sediments from the seabed surface, but also “pumping” internal fine-grained sediments into the overlying water column.